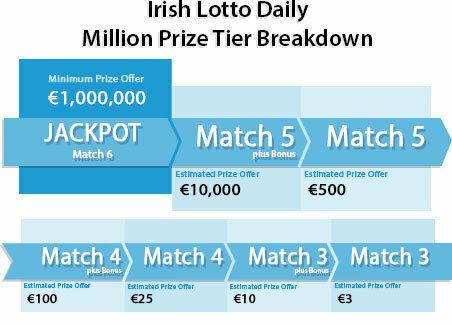 Irish Daily Million was introduced in September 2012 to replace both Monday Million and All or Nothing. This lottery is a 6/39 weekly lottery with a fixed jackpot of €1 million with draw taking place every day of the week including the weekends and bank holidays. Match 6 main numbers to win the jackpot prize and take home €1 million jackpot prize. A Bonus ball will be drawn after the 6 main numbers. This Bonus ball will increase your odds of winning the consolation prizes. Choose 6 numbers from 1 to 39 or click “Lucky Pick” to play with random auto-generated numbers. Click “Add More Lines” to play for additional lines. You can play from 1 line up to 30 lines per ticket. Play for additional tickets thereafter. Choose your days. Daily Million draw happens every day so choose which day or days you wish to play. Select your weeks. You can play for the upcoming draw or if you want, you can also select to play for multiple future draws. After you have placed your order with us, you will receive your OneLotto official ticket(s), which can then be viewed within your “My Account“ page. Once each draw has taken place and the prize breakdown has been announced, OneLotto will publish and upload the results onto our website. All participating players will also receive an email notification containing full result. The Bonus ball only applies to consolation prizes and not for the jackpot prize. All prize winnings including the jackpot are fixed. When there are no winners for the jackpot prize category, the jackpot will not roll over.